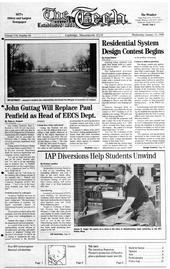 John Guttag Will Replace Paul Pennfield as Head of EECS Dept. Aimee B. Angel '00 works on a stool in her Intro to Woodworking class yesterday in the MIT Hobby Shop. Not so Frosty � January's weather has substantially shortened the lifespan of snowmen on campus.